The following narrative (transcribed from the original Reference Document (2,765 kB)) was found in a folder labeled "History 1972" and appears to be a collection of KO details to supplement to the, then current, APO pledge manual. The Argo Cup, commonly referred to as the "cup", has been in the possession of Kappa Omicron Chapter since 1965 and in this short time the "cup" and the "cup party" have become events which are greatly looked forward. to. Our "cup" is the one and only cup ever 'borrowed" from Mores at Yale University. Four brothers were there at the time of the procurement Bill Sockey, Arney Klayman, Dave Arlen and Dave Greenstein. Associated with the "cup" is the secret cup mixture. This mixture belongs to the fraternity and is held in trust by the brothers who were last awarded it. Besides the original brothers who procured the "cup" from Mores, the secret has been passed down and is currently held by Leo Edmonds and Bob Myette. It is best to stand with feet firmly planted and sup­port the Cup by its two handles. 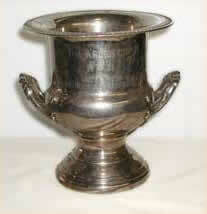 The silver Argo Cup is perfectly balanced and will naturally tilt forward pouring forth the "nectar of the gods." Two brothers stand on either side of the person drinking from the cup holding a towel beneath the mouth of the person and eventually holding the brother up. Two refrains are sung while the person drinking "chugs" the mixture. Put a nickel on the drum, save another drunken bum and you'll be saved. No words can really describe the cup, cup-mixture or cup party. It's an experience unto itself. As a service fraternity we are constantly looking for new ways of bringing service to the chapter, campus, community, and nation. Kappa Omicron Chapter realizes that initiating a new project is often difficult and is worthy of merit: The Tuttle Mug was initiated with the idea that this initiative, work, and time would not go un rewarded. This silver Paul Revere bowl is annually given to the Brother in Kappa Omicron Chapter who, in the eyes of the Brotherhood, epitomizes the principles of leadership, friendship, and service. The award was originated in the Memory of David B. Arlen who was killed in an automobile accident on the way to the 1966 Alpha Phi Omega National Convention in Minneapolis, MN Dave was a "true brother" who always gave his all for the fraternity, including his life. Therefore, this coveted award has been dedicated to his memory. During the years 1951 and. 1952, interest in a fraternal organization dedicated to doing service rose on this cam­pus. Alpha Phi Omega was the organization that best exemplified the type of service organization that the original brothers and advisors wanted. Information from the national office was requested, and eventually, a petition was sent to Alpha Phi Omega requesting consideration for a. charter. Our founders on this campus were, E.G. Warner, who presented the first charter on May 18, 1952, in Memorial Hall to five officers and nineteen brothers; Harold M. "Kid" Gore, and, active man in Scouting, "Red" Ball, Dr. Gordon King, Ronald K. Mansbach, the first president, brothers William Whitmore, Harris Tanner, and Dave Lincoln, and advisor Mr. Alden P. Tuttle. In the pledge manual there is a short paragraph dedicated to David D. Arlen. But, in light of the fact that he was probably the most prominent brother in Kappa Omicron history he deserves more recognition and you, as a pledge, should know more about him. An excerpt from a letter by Arney Klayman, former member of this Chapter really tells beautifully of and about David B. Arlen. "The most significant Brother had to be Dave Arlen, of course. Dave had been Service V.P. before me [Arney Klayman] and in an attempt to bring the Fraternity closer together into a Brotherhood had nearly succeeded in breaking off a new chapter. This is not a particularly pleasant memory, but it is part of the history. I think it caused enough controversy and activity to really rejuvenate the Chapter, although it cost Dave the Presidency. Dave was killed in an auto accident in Wisconsin on his way to a National Convention in December, 1967. Meetings were much quiet­er and less fun for the rest of that year. Dave is tough to describe. Speaking personally, sometimes I loved him, sometimes hated him, often fought with him, frequently drank with him, always respected him, and still miss him. He was driving the NES bus and I was riding shotgun the night it blew up. Smoke poured from the engine into the bus proper. Dave couldn't see, and as he tooled down the road coughing end cursing, some brave Pledge leaned out the open door calling such helpful information such as, "Get this f---ing thing back on the f---ing road, you s---head!". We weren't sure whether to laugh or scream until he coasted through a red light in the center of town and finally stopped. The pledge hitch-hiked back to campus, getting a ride with the biggest girl I have ever seen in my entire life who drove a big Harley and wore a black leather jacket with brass studs. He was never seen again. Dave and I were rolling on the ground convulsed with laughs and smoke as he rode off screaming, "I only regret that I have but one life to give for APO!". Now that was a pledge. And Dave-----well, that was a Brother. The David B. Arlen trophy had better still be around and displayed in a prominent place." The first project the newly formed Kappa Omicron Chapter of Alpha Phi Omega did was the erection of a bridge across a stream where the school of Business Administration now stands, connecting the Central area with the Main Quadrangle. This project "kicked off" the tremendous service program that we have had over the years, and still have to­day. There was a time when we did tremendous amounts of ser­vice, but were virtually unknown because we were a service club and. not a. fraternity. These were the days of 125 active Brothers and 50-60 pledges. The Brothers at this time did a lot of service but they were members of a club and nothing more. To combat this, membership policy became more selective thereby cutting down the numbers, and also fellowship took on a more active role in our fraternity, to instill Brotherhood. From the past until now, one might believe that Alpha Phi Omega at the University of Massachusetts has ridden a smooth road. This is not true. An excerpt from a letter by Mike Sissenwine, a prominent brother and officer from the past tells graphically of a disturbance and potential threat to the fraternity. "During the 1964-1965 academic year with John Kucharski and Jack Kooyoomjian as Presidents, Kappa Omicron was named the #1 Chapter of Alpha Phi Omega for schools of Its size in the country . Other prominent persons of this period were Steve Pretanik, David Greenstein., Roger Crouse, Ed Skea Denny Myshrall, and perhaps most important, David B. Arlen. During Arlen's two semesters as service vice-president (1965-1966), a true Service Committee was formed with service chairmen for community, chapter, national and international service. This may have been Kappa Omicron's finest hour service wise. Although from the outside all appeared to be going well at this time many of the most prominent brothers lived off campus in two separate houses. Roger Crouse, Ed Skea, Bill Sockey and others lived at "18 South" as it became known while Dave Arlen, George Dimock, Dave Greenstein, Steve Pretanik, and at times, Peter Anderson lived at "414.” The "18 South" group was traditionally more serious and regimented, having a. set of By-Laws pertaining to their house. These By-Laws perpetuated through several years (1963-1967). "414" was the old Coffee House in which Buffy Saint Marie got her start. Coffee had been replaced by alcohol which would flow like a rushing river every weekend. This situation was one of the strongest testimonials for APO: these two groups which were so different both contributed of themselves to help others. But, Arlen, Greenstein and Pretanik, strongly supported by Anderson wanted the Chapter to be more than just a service club--they wanted a strong Fraternity. They also recognized that many brothers were not doing their share of the work and felt that a strong feeling of fraternalism would help eliminate this since brothers would feel a responsibility to help other brothers do the work taken on by the Chapter. They hoped that a strong feeling of fraternalism would help to obtain more respect for Kappa Omicron on campus (unfortunately, at this time many brothers would not admit to being members because they were immediately considered Boy Scouts). For these reasons they (Greenstein, Arlen, Pretanik), formed GAP which was a fraternity within the fraternity which would be made up of only those brothers who would contribute fully to all service projects and show a sincere desire for fellowship. Unfortunately, because of the active social life of the founding brothers, GAP was misconstrued as an attempt to change Kappa Omicron into a. social fraternity. Because of opposition from most of the Brotherhood led by Crouse and Ski (supported by Joseph Scanlon, National Director) GAP was officially disbanded although its founders never stopped working; toward the establishment of its principles. Because of this incident, the Brotherhood always feared that GAP’s founders would change APO into a social fraternity." We have not changed into a social fraternity, but at times I am sure ideas such as GAF have run through many brothers’ thoughts, but as ones designed to pull the Brotherhood together. This is a. very cursory history, but it is the best that can be done with the bits and pieces collected from newspaper, end letters from graduated Brothers. It is, although an important pert of this manual, end the education of pledge. We start this semester off with "Operation CF" (Chris Fredericks). This project, started in 1969, involves directing traffic in the Southwest area so as to facilitate the process of Freshmen and Upperclassmen habitation. "Registration Aids" immediately follows; This involves standing in 90° heat in jacket and tie for 6 hours in helping the dumb freshmen fill out their registration cards (or as Mike Roberts puts it: "We assist the Administration in the coordination and continuity of traffic flow for undergraduate registration at the beginning of each semester)". Don Fontes was instrumental in the initiation of this project and also in that of the Book Exchange. At BX we cover some of our operating expenses for the year. Books are taken in from the student population and sold for them at a small fee. This past semester [1972?] we sold 1,123 books. Every November we run a mock gambling casino in the Student Union Ballroom. "Las Vegas Night" is a major campus event that involves much planning. The semester previous to this one saw over $300 given to charity from this event. A good time is had by all, especially the brothers and their dates who run the tables, auction, and the other events. Blood Drive is a project, like the BX, that occurs twice a year. We put up advertisements and take pledges for blood. When the bloodmobile arrives, we assist with setting up and help with the canteen. Next follows "S.C.R.E.W." (Student Committee to Re-Evaluate our Educators' Weltanshaung) and U.M.O.C. (Ugly Man. on Campus). The educator who gets SCREWed and the U.M.O.C. winner both receive commemorative plaques with the money donated (in the form of penny votes) going to charities. The Easter Sunday project (started by Ernie Bettez An 1970) finds brothers and pledges visiting nursing homes and the children's ward at a local hospital to pass out baskets and good cheer. They are led by a six-foot rabbit. But the most important gift from the project isn't candy or laughs, but the knowledge that someone cares, someone will come and talk. This is also true of Housing for the Elderly, which has no set date as do many of our other projects. Camp Anderson, a privately run non-profit summer camp for children, is located in Leverett. We have built several cabins there and. are at work row on another. We also do general maintenance work such as draining the pond, clearing brush and pre­paring the cabins for winter. Frequently during the semester brothers will go to the Belchertown State School and visit and play with the children. This is a project which seems to be on its way to better and broader involvement. Handi-Cap Aids, started by Mike Roberts, is our effort to enable handicapped persons on campus to help themselves. President's Path and the Rideboard are also part of our service effort. We will be ushering for the UMass Music Theater this semester and when the Fine Arts Center is completed will expand this project. You may already have heard the brothers talking about "The Little Putzas". If you'd like to take some children out for bowling, movies, or anything else you think might be enjoyable, see Putzsa Kochoff or La tete. We finished the year off with our most involved project, the Amherst Fair. The brothers organized this event, set up the tent grounds, the parade, the pet show, ad nauseam. This comes in May, but the actual work starts in October. This list of service projects is by no means complete. Service meetings are open and if something interests you especially you should contact the brother in charge of it. Be­sides your own pledge project, the Brotherhood is always looking for good service ideas.